This tutorial adds a new connection that can be either an initial connection or an additional connection. 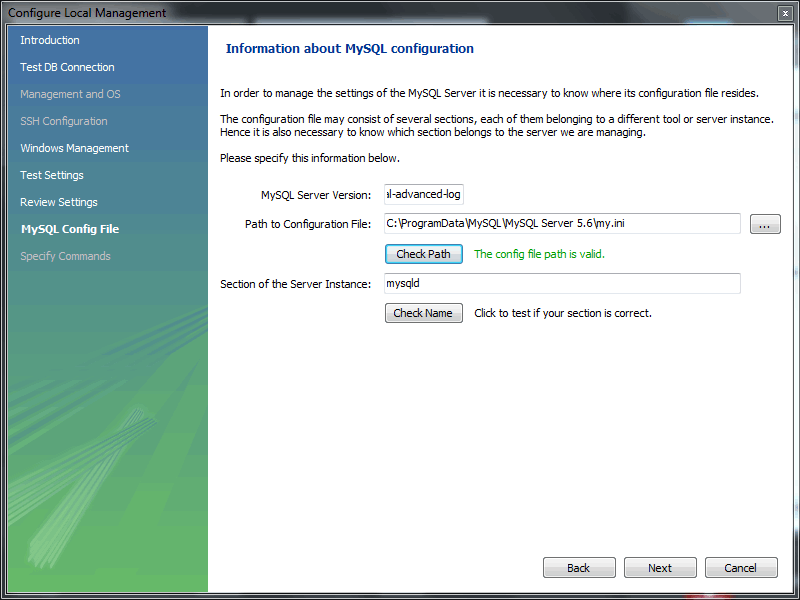 An instance of MySQL server must be installed, started, and accessible to MySQL Workbench before you begin. Launch MySQL Workbench to open the home screen. Existing connections are shown when you click the MySQL Connections view from the sidebar. No connections exist for first-time users. 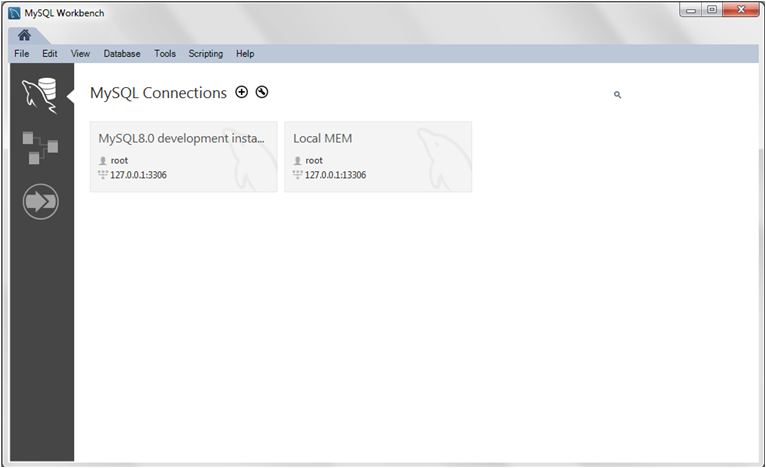 From the MySQL Workbench home screen shown in the previous figure, click the [+] icon near the MySQL Connections label to open the Setup New Connection wizard. Define the Connection Name value, such as MyFirstConnection as the next figure shows. 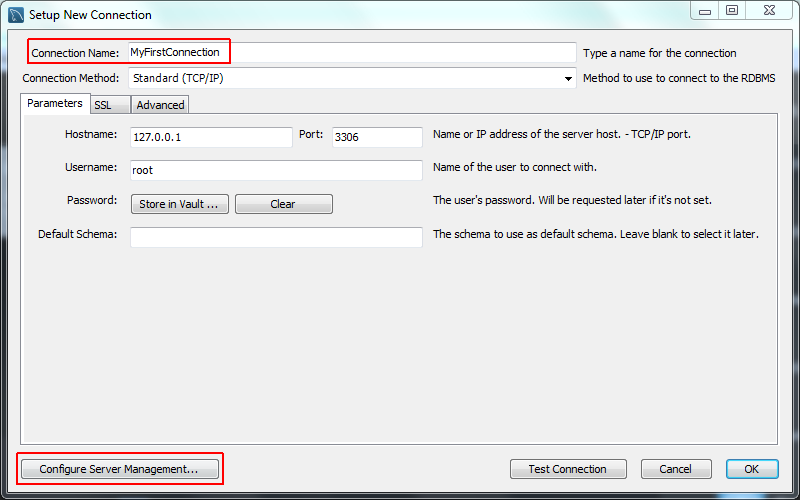 The default connection values are for a typical local setup, so check them and enter the appropriate values. If you are unsure, click the Test Connection button to check the connection parameters. Do not press OK.
Read the Configure Local Management introduction (shown in the next figure), and press Next to begin defining the new connection parameters. The connection will now be tested. You should see that the connection was successful. If not, click Back and check that you have entered the information correctly. The following figure shows a database connection that tested successfully. Toggle the Show Logs to view additional details about the tested connection, then click Next. 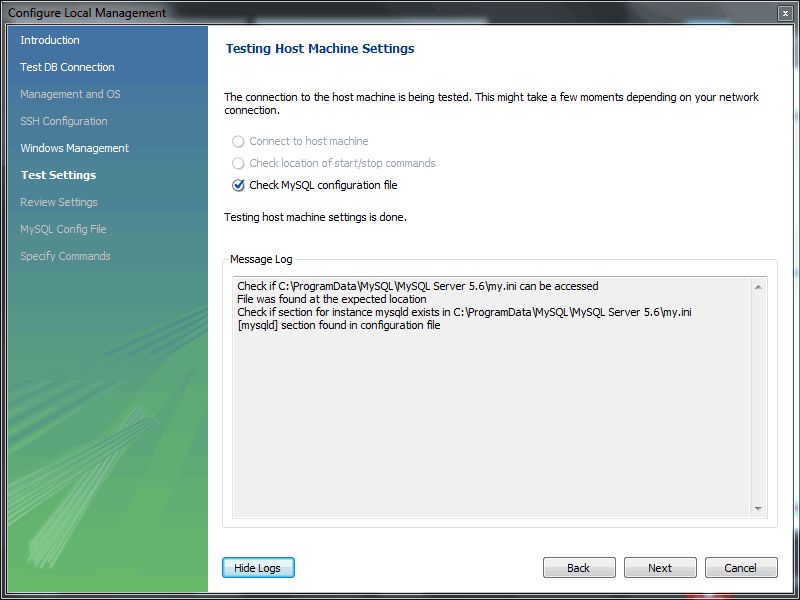 Optionally, you may configure a method for remote management if a Remote Host was specified. 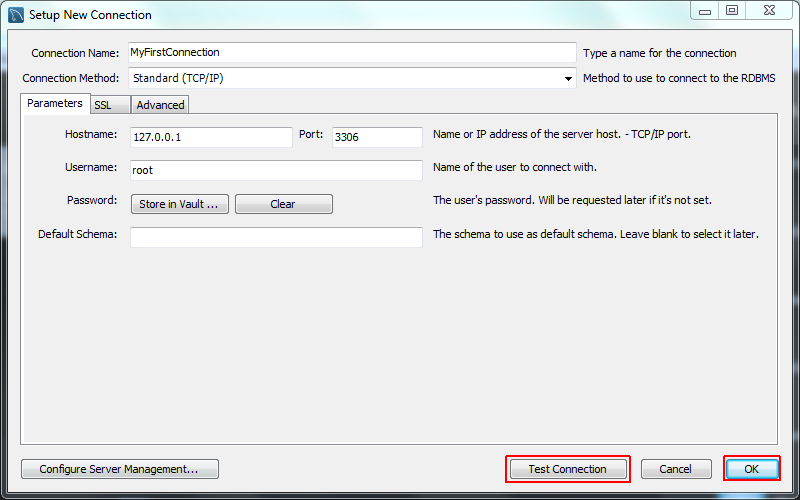 Setting these options enables MySQL Workbench to determine the location of configuration files, and the correct start and stop commands to use for the connection. 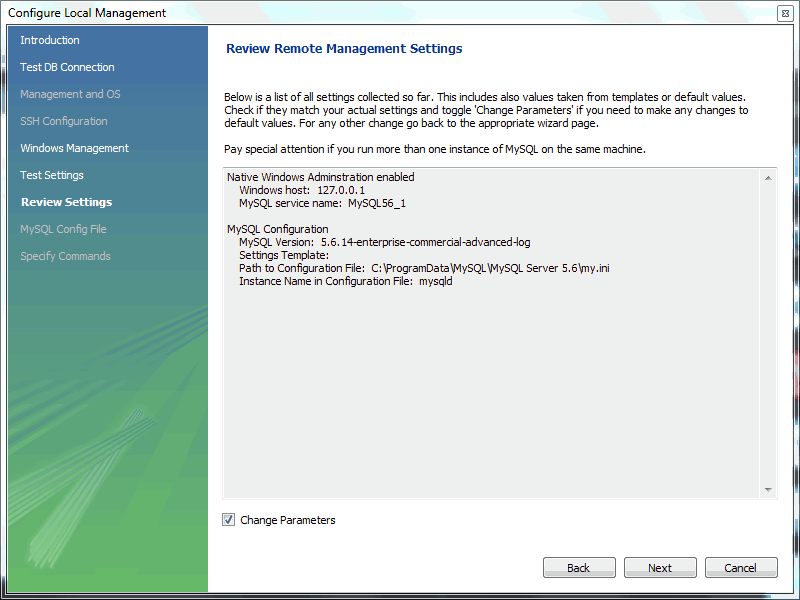 SSH login based management and Native Windows remote management types are available. The Operating System and MySQL Installation Type are configured for the SSH login variant. This step creates a local MySQL connection, so you can skip the Management and OS and SSH Configuration options, which are used for configuring a remote MySQL connection. 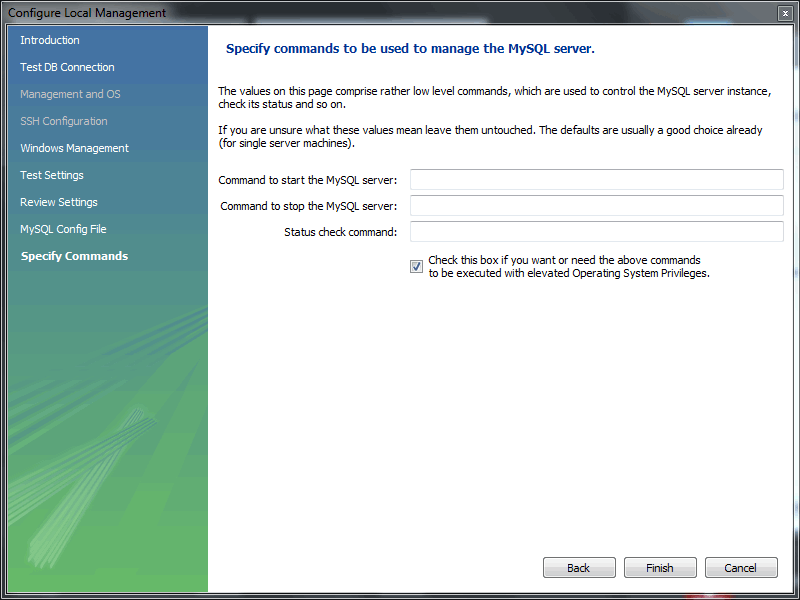 On Microsoft Windows, select the appropriate MySQL service for the MySQL connection, as shown in the figure that follows. The wizard will now check its ability to access the start and stop commands and then check access to the MySQL Server configuration file as the next figure shows. You now have a chance to review the configuration settings. The information displayed varies slightly depending on platform, connection method, and installation type. At the Review Settings prompt, choose I'd like to review the settings again to review the settings as shown in the next figure. 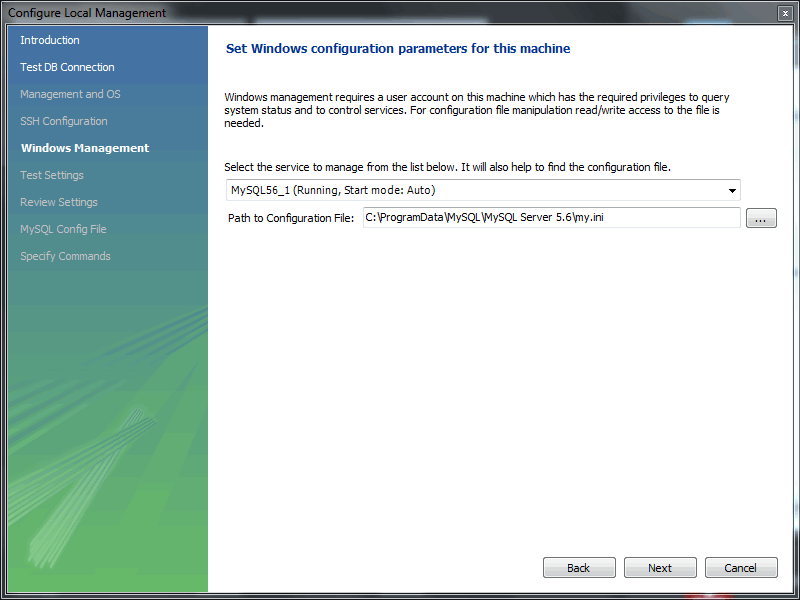 Choosing Continue closes the Configure Server Management dialog. Check the Change Parameters if you want to check or edit information about the MySQL configuration file. For this example, select the check box and click Next to continue. Review the MySQL configuration file information shown in the next figure. Click Check Path and Check Name to perform the described checks, or optionally change the configuration file path. Optionally, enter your own commands for starting, stopping, and checking the MySQL connection. To apply the default values, leave these optional values blank as the following figure shows. 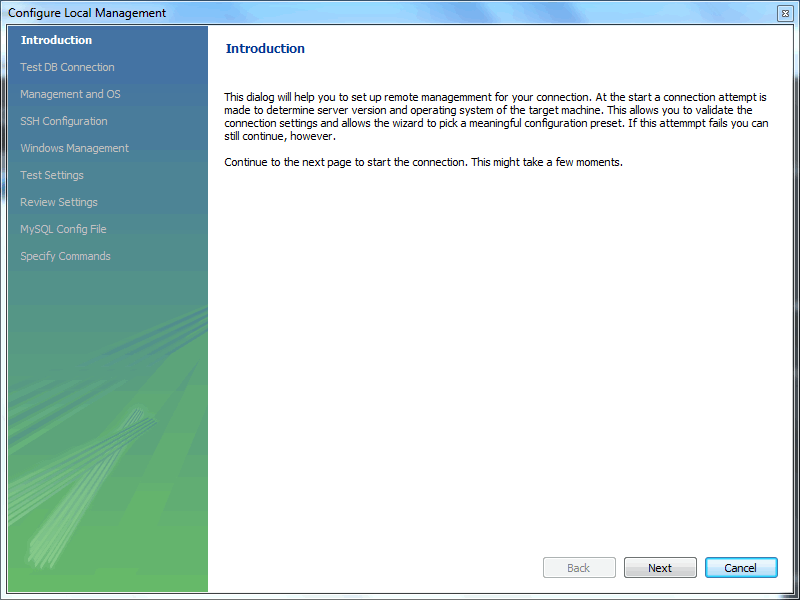 Click Finish to close the Configure Server Management dialog, which returns to the original Setup New Connection step. After reviewing the Setup New Connection information (see the figure that follows), click Test Connection again to make sure it still functions and then click OK to create the new MySQL connection. Your new MyFirstConnection MySQL connection is now listed on the home screen. From the home screen, click the new MySQL connection to open the SQL editor for this connection. The SQL editor is the default page. Click Server Status from the Navigator area of the sidebar to display the current status of the connected MySQL server instance (see the figure that follows). 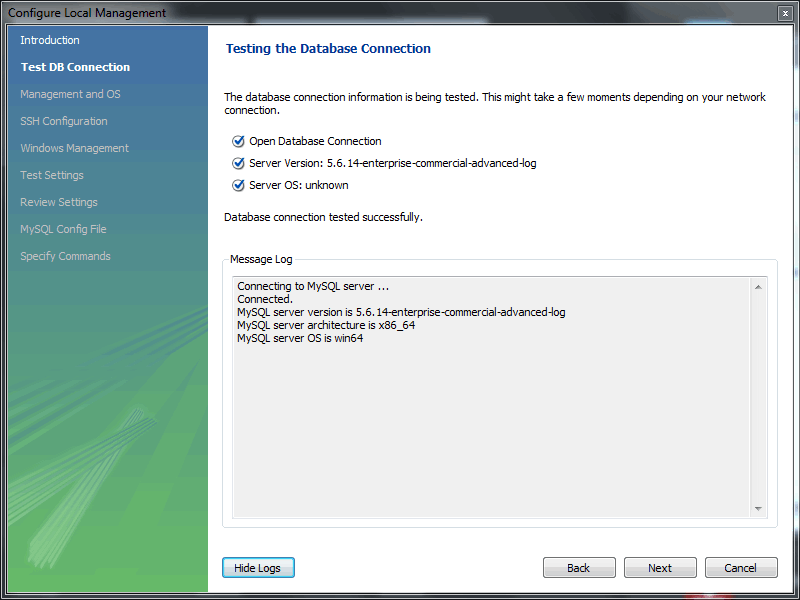 Test the other Navigator area options that relate to your new MySQL connection. Check its status, MySQL logs, and measure its performance statistics from the Dashboard. Notice the Administration and Schemas tabs in the Navigator area. The Schemas view displays the schemas that are associated with your new MySQL connection. Alternatively, you can merge the content of the tabs by either clicking merge ( ) or by enabling the Show Management Tools and Schema Tree in a single tab SQL editor preference. For additional information about MySQL connections, see Chapter 5, Connections in MySQL Workbench.